Opening reception: Friday February 8, 6-8 p.m.
Andrea Rosen Gallery is delighted to present Aaron Bobrow's first one-person exhibition in New York. This exhibition shows the expansive breadth of Bobrow's practice of painting, video, and works on paper. "Bright lights are placed at regular intervals along the surf line, so that now the sea can be enjoyed on a truly metropolitan shift system, giving those unable to reach the water in the day time a manmade, 12 hour extension [ . . .] false daytime is not regarded as second rate." Bobrow is not only interested in how these works relate to place, and particularly within this body of work a certain New York urbanism, but how the mesh-covered building is as real an experience as it was before being covered and how the mesh painting is as similarly real as it was in its original place. The paintings in the exhibition retain their relationship to their original habitats, as well as their various means of extraction. The unadulterated shapes of the material dictate the sizes of the works. The artist simultaneously creates an abstract painting and an aggressive plane, brutal in its reduction of traditional, artistic gesture so that there is a rigorous paring down to the most essential gesture. Bobrow shows the multiplicity of gestures and marks that the material has already accrued from countless sets of circumstances, anonymous individuals, environmental effects, and the removal itself. His works highlight the stark differences between how we experience gesture in the everyday world versus a gallery or museum context. 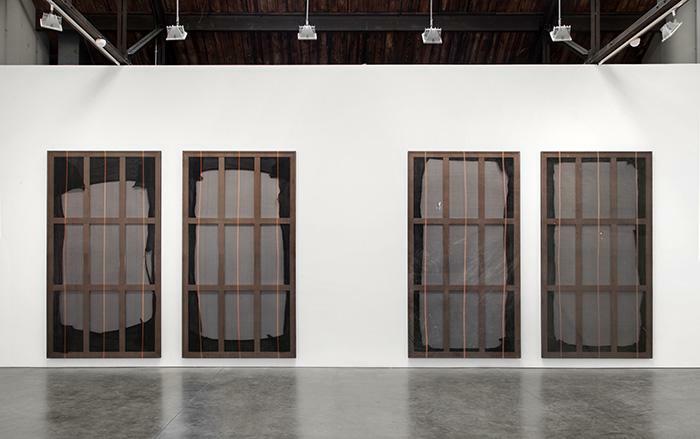 Bobrow reexamines the material's purpose, and its inherent transparency reveals the construction of the painting. The shocking exposure of the painting's interior subtly alludes to everything that the material is meant to conceal, protect, and contain. In a city undergoing an endless cycle of destruction and rebuilding, the paintings stop time and point to a frozen present. 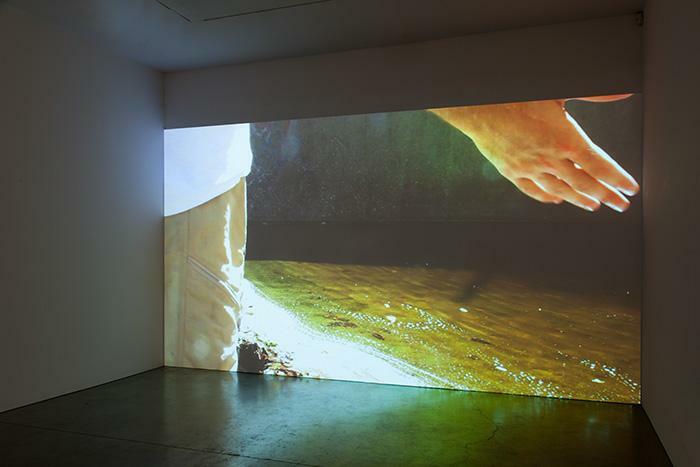 In Acoustics (Eaton Canyon), 2013, the viewer sees the artist clapping his hand over a running body of water. Each clap is answered with a reverberation. The sound returning is conditional to the specifics of each clap and its physical relationship to the concrete space. 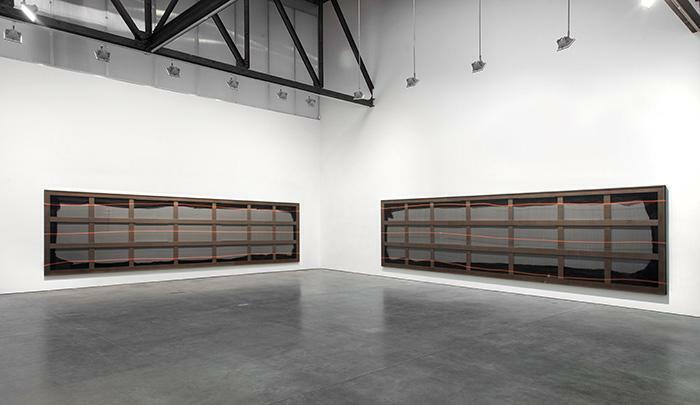 The video shows that Bobrow creates each sound, while the dimension of his inanimate partner, the concrete, is left unknown. In the installation of Acoustics (Eaton Canyon) Bobrow places the viewer in a real space, surrounded by sound and engulfed by the projection. Both the debris mesh and the reverberation of his claps act as a kind of skin shed from an original body. Whether traveling from building site to gallery or from hand to concrete and back, each entity retains a relationship to a source and remains unaffected and pure. Aaron Bobrow (b. 1985, San Francisco) received his BFA from Parsons School of Design. 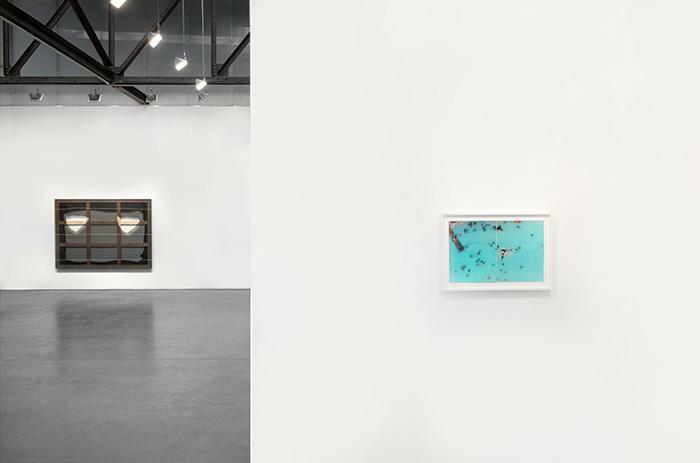 Electric Bathing is his first solo exhibition in New York, where Bobrow lives and works. Bobrow's tarp paintings and photographs were the subject of his recent solo exhibition, No Sleep In the Exit Row, at Office Baroque in Antwerp. 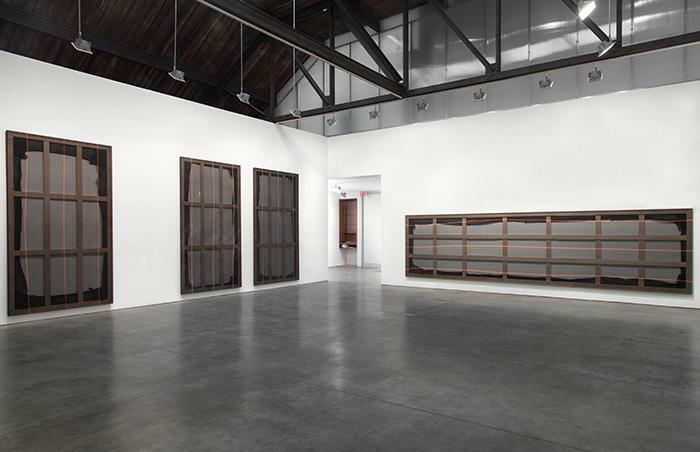 Bobrow has been included in several group exhibitions in Europe and the United States, including at Andrea Rosen Gallery, Brand New Gallery in Milan, and in New Deal, curated by Kyle Thurman and Matthew Moravec with the Art Production Fund.